As expected Apple has finally released iOS 8.4.1 to public and it is now available for download. The release comes for all models of iPhone, iPad and iPod touch that are capable of running iOS 8. If you are interested in updating to iOS 8.4.1 then you can do so by going to Settings > General > Software update. Alternatively, you can update through iTunes or by downloading the IPSW file on your computer. iOS 8.4.1 does not bring any new features to iOS and focuses on bug fixes and performance improvements. In this release Apple has fixed the issue that prevented iCloud Music Library from getting activated. 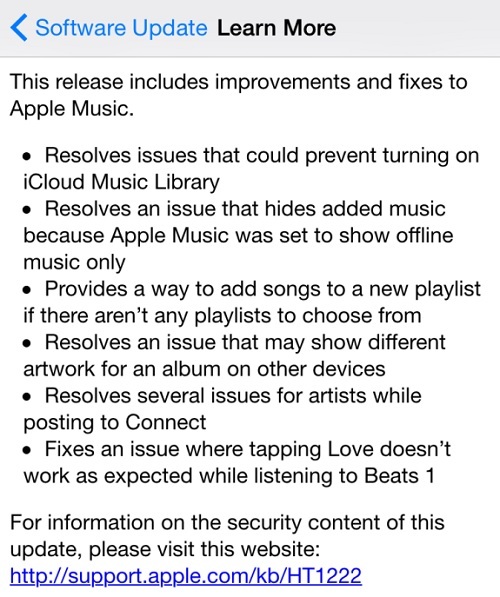 Music app has also seen a bug fixes as issue that caused newly added music to disappear has been solved. Users will also be able to add songs to new Playlists if there are no playlists available. Other bugs related to album artwork, iTunes Connect and Beats 1 have also been fixed. If your device is jailbroken then we advise you to stay away from iOS 8.4.1 until team TaiG has confirmed their tool works with this release.